City attorney Carrie Miljevich listens as alderpersons discuss her contract during a special Common Council meeting Tuesday, April 2, 2019 at City Hall. Following a brief closed session discussion, the council voted 5-4, with Mayor Chris Frederickson casting the deciding vote, to terminate Miljevich�s contract effective May 31. 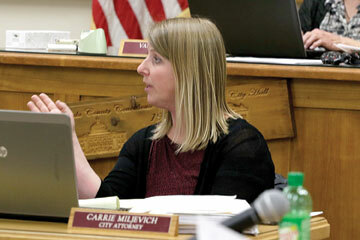 A bitterly divided Rhinelander Common Council voted 5-4 Tuesday evening to advise city attorney Carrie Miljevich her contract will be terminated in 60 days. Mayor Chris Frederickson cast the tie-breaking vote to oust Miljevich following a very brief closed session discussion, approximately 30 minutes in length, with an outside attorney, James R. Lacy of von Briesen & Roper of Oshkosh. The meeting itself was hastily arranged as notice of the special meeting of the Common Council was sent out approximately 25 hours before it was scheduled to begin. At the meeting's outset, alderwoman Dawn Rog rebuked the mayor for calling a special council meeting on Election Day, further stressing city clerk Val Foley and her staff on one of their busiest days of the year. "These people probably have to put in 15 to 17 hours in today from having to get the polls ready until after they close," Rog said. "I think it is a disrespect by our mayor, in less than 24 hours, to put the pressure on the clerk to have a council meeting tonight. This is just one more disrespect for the City Hall employees." (Later, as she prepared to leave City Hall to go to polling places, Foley told the River News the special meeting had made a very challenging and difficult day for her office even more challenging and difficult). Frederickson did not respond to Rog's remarks or offer any explanation for the decision to hold the meeting on Election Day. He also failed to respond to a list of written follow-up questions from the River News which included a request to explain the timing of the meeting. After Frederickson opened the floor for the open session portion of the meeting, to review city ordinances and the current services agreement regarding the appointment and duties of the city attorney, Rog and council president George Kirby asked who would serve as the city's legal counsel during the discussion. "I don't know why we're here, either," Rog said, echoing a comment from Miljevich expressing confusion about the purpose of the meeting. "And we do not have any other city attorney. So if we do go into closed session, it will only be the council and the mayor." "We do have a city attorney with us," Frederickson said, referring to Lacy. This led to a series of questions related to Lacy's hiring. Rog insisted the council had not directed Frederickson to hire an attorney to advise the council in this matter. "A city attorney has to be approved by the council," Rog said. "We do not have the ability to go out and hire someone individually." Frederickson disagreed, insisting he has unilateral authority to do just that. He claimed he is using funds from his "legal budget" to pay Lacy's fees. No questions were asked as to what Mr. Lacy's fee is or how much city taxpayers can expect to pay for his services. Lacy noted that von Briesen & Roper has represented the city on numerous matters, and is currently defending the city in two pending Dark Store lawsuits. In addition, he cited legal work the firm did for the city 2 1/2 years ago related to labor issues. "And we're here tonight to assist as well," he said. Kirby again insisted the council had offered no authorization to the mayor, or anyone else, to go outside the city for legal representation on this matter. Frederickson then said his decision to hire Lacy was in response to the declaration of "no confidence" that Foley, public works director Tim Kingman, assistant clerk Mary Stoll, utility clerk Beth Mannikko and administrative assistant Stephanie Rajnicek presented to the council March 11 regarding city administrator Daniel Guild. Frederickson was scheduled to update the council on that investigation at the panel's last regular meeting March 25, however when the topic was raised that night he said he no update. Rog asked what had changed in the intervening eight days and for an explanation as to how the Guild "no confidence" investigation had led to a discussion regarding firing Miljevich. "Tuesday morning (March 26), I met with an individual (later identified as Rick Hermus) that had said in an email that he would be willing to work with us on the investigation," Frederickson replied. "He was highly recommended by our own attorney (Lacy)." Rog replied that the allegations made in the "no confidence" declaration are very serious and noted that Hermus has ties to Guild, which poses a potential conflict of interest. (The River News has obtained an email sent from Guild's city account in which he refers to Hermus as a "a valued colleague of mine"). For his part, Lacy said he had just met all of the parties involved and has no bias whatsoever. "Don't you think you have gone over and above your limits to come and stack the deck,?" Kirby asked Frederickson. "It's perfectly appropriate and legal," the mayor replied. "You've really set the table against us right now, you really have," Kirby replied. "I want that to go on record." Miljevich noted the state statute that outlines the duties of city officers says the council may employ and compensate special legal counsel. "Again, my position is that if the Common Council wanted to hire special legal counsel, it could have," Miljevich said. "I don't think the mayor has the legal authority." She also argued that the city's existing retainer agreements with von Briesen & Roper do not extend to the purpose for which Frederickson is now employing the firm. "I think it is in violation of statutes," she said, adding that the appropriate course of action would be for a new retainer agreement to be drafted. After a vigorous back and forth between Miljevich and Lacy on the same issue, alderperson David Holt made a motion to go into closed session and Steve Sauer seconded it. The closed session lasted approximately 30 minutes, near the end of which Rog and alderman Tom Kelly came out early. "They are talking nonsense in there, they aren't making any sense," Rog said. Before the vote, Miljevich made a brief statement backing up a claim she made in an email to the council earlier in the day. "I believe that I am targeted, for reasons I am completely unaware of," she said. "Perhaps it's gender, perhaps it's because I gave a note saying 'no, we can't do that,' I just don't even understand what is behind this motion." "I also think this is retaliatory," Rog noted. "This started out with Sherrie Belliveau (a veteran alderperson who resigned abruptly in December), the next was me, it's now the city attorney. Mayor Frederickson has absolutely no interest in having any women in the city government of the city of Rhinelander." The council then held a roll call vote to terminate Miljevich's contract effective in 60 days. Aldermen Sauer, Holt, Ryan Rossing and Andrew Larson voted to terminate the contract while Rog, Kirby, Kelly and Lee Emmer voted against. Frederickson broke the tie by voting in favor of the termination. Within minutes of the roll call vote, Frederickson handed Miljevich the official signed termination letter. When asked whether the letter was prepared in advance of the meeting, Frederickson did not offer a clear answer. After the meeting was adjourned, Miljevich read a statement to the assembled media. "I have done nothing wrong. I have given sound legal advice over the last 5 1/2 years, and, quite frankly, I do not understand why this occurred," she said, reiterating that she believes her termination is retaliation for standing up to the city administrator and mayor. "One of the only voices that stood up to inconsistencies at City Hall is now being silenced," she said. Rog went further, openly accusing the mayor and others of attempting to remove women from positions of authority at City Hall. "This is a total attack on women. Women just have no place anymore in City Hall," she said, adding that she believes Miljevich would still have her job if she were a man. Frederickson, she said, should resign immediately for the good of the city. When local media representatives pressed Frederickson to explain what Miljevich had done that warranted termination, he kept repeating "it's time for a change." Miljevich has done good work for the city in the past, but it's time to move in a different direction, he said. Frederickson did not respond to a River News request to respond to the allegations of sexism and retaliation. Miljevich's last day with the city will be May 31, however she indicated she intends to confer with an attorney and investigate her options. Jamie Taylor may be reached at jamie@rivernewsonline.com. This is far from an attack on gender. It is a mayor doing what he believes is his job to start taking the city back for the people. There is a little group of people that have been at the epicenter of dysfunction and corruption within City Hall for a number of years. They include Alderman Rog, Alderman Kirby, Former Alderman Belliveau, Former Administrator Kost, Public Works Director Tim Kingman, and City Attorney Carrie Miljevich.Now they cry wolf that they are being targeted. There was no gender card thrown out when Kristina Aschenbrenner was unjustly terminated. Also Alderman Rogs comments about Alderman Belliveau are laughable because didn't Belliveau resign because of "health reasons". Should people be allowed to use the internet to distribute directions for making 3-D printed plastic guns? I need more information before offering an opinion. I have no opinion on this question. Do you agree with the School District of Rhinelander�s decision to dismiss football coach Chris Ferge? Which of the following best describes your reaction to the Republicans move to curtail the power of Governor-elect Tony Evers and Attorney General-elect Josh Kaul? I have no issue with it. It�s a normal part of today�s politics. It�s unconscionable, but I�m confidant the courts will overturn the bills. I�m OK with it as long as both parties are allowed to do it. Which City of Rhinelander elected officials should be recalled? All of them. The mayor and the entire Common Council. I would recall the council but keep the mayor. I would recall the mayor but keep the council. Everyone but alderman Emmer, as he was just appointed. Frederickson, Sauer, Holt, Rossing and Larson.